It’s week three of our celebration of September as National Sewing Month! Join BERNINA at WeAllSew as we celebrate with a month of super sewing giveaways! Come visit us each Friday in September to join us in sharing our love of sewing while entering a random drawing to win a BERNINA backpack filled with sewing goodies. We loved reading all your comments on last week’s question, “What kind of sewing project is your favorite?” You sew everything and anything under the sun, from quilts to dolls and decorations for the home! We’ll draw a winner at random from all your comments and we’ll let you know who the winner is as soon as we contact her/him. Who taught you how to sew, and have you taught anyone else to start sewing? Sweepstakes Rules: Open to residents of the 50 United States and the District of Columbia. One comment per fan. Comment must be submitted to the WeAllSew.com blog by Thursday, September 11 18, 12:00 midnight Central Time. Winner will be chosen randomly. Winner will be notified by email and will have 48 hours to contact us at WeAllSew@berninausa.com to claim the prize; winner will be announced on WeAllSew about one week after contest ends. Having trouble logging in? Try logging out, closing your browser and waiting a few minutes before trying again. Still having trouble? Send us a message at WeAllSew@berninausa.com. 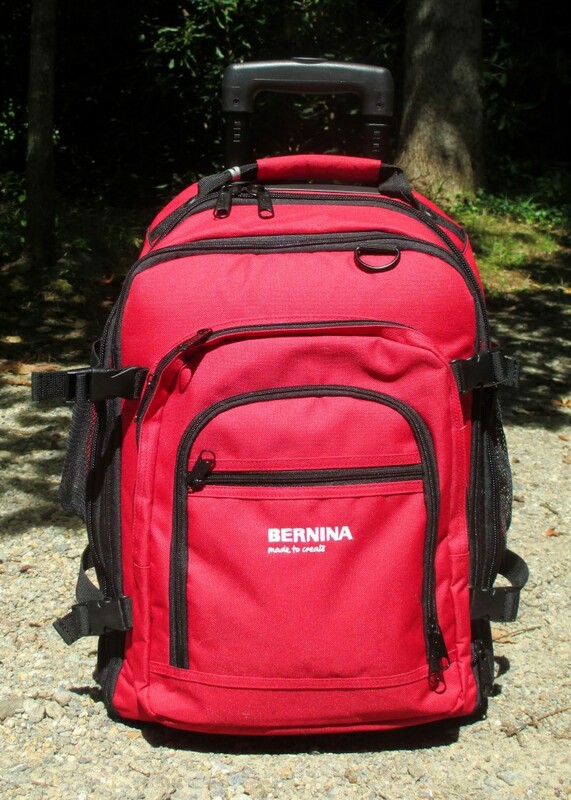 Our weekly winner will receive a BERNINA backpack filled with goodies! Congratulations to our third National Sewing Month contest, WeAllSew user sjarnie81! We hope you enjoy your new BERNINA back pack and sewing goodies, and thanks for joining us at WeAllSew.com! My Home Economics teacher started me on my sewing journey, with my Grandma teaching me many things. At Grandma’s I sewed on a treadle sewing machine. I am still learning many things about sewing, quilting, embroidery, etc. from Bernina’s webinars, tool tips, and manuals for my new 880 sewing machine. I’m mostly self taught, but I learned my first stitch at beginner classes at Sew LA. I also try to watch Craftsy classes and go to workshops, but bloggers have been the biggest influence in my learning curve. No, I don’t think I’m good enough to teach others at this point. I first learned in home economics in high school, but did not sew again until last year. My sister gave me a sewing machine for my birthday and I’be been teaching myself to sew again. I sew mostly for my daughter (6 years old next month!) Who loves skirts and dresses with a twirling factor! I am starting to teach her how to sew. We are beginning with skirts for her favorite doll. I am a little confused. This post says it was posted today, but says that all comments must be received by September 11 ( which was yesterday). Am I reading his wrong? My mom taught me at first, and then I had sewing in Home Ec in junior high school. I taught my daughter at little and bought her a sewing machine. Started learning to sew in Home Ec., then started watching shows like Sewing with Nancy and other Quilting shows and slowing taught my self. I have always had a love of creating things, Halloween costumes for the kids, quilts, wall hangings. I secretly call myself a fabric artist, lol. I am currently working on Memory Bears, and quilts, up cycling treasured dresses and t-shirts into these items. LindaLee Hodges taught me to sew when I joined her Mystery Group in our quilt guild. So grateful to her for her tips & patience! My mother taught me to sew. I have taught my daughter! My Grandmother taught me on a treadle machine when I was just a toddler. I in turn taught my daughter, lots of her friends and countless others. I become a better teacher with every student. My grandmother and a wonderful home ec teacher taught me to sew. I have taught lots of adults to sew and teach 4 H kids. I also volunteer at a local Christian school and teach sewing. I have used several of the ideas from WE ALL SEW for projects for the kids. My Mother taught me to sew and I also took sewing lessons as I got older. I have taught my daughter-in-law how to quilt. My 4 year old granddaughter loves to play with my material and arrange it. I’m hoping she will want to learn to sew too. I learned to sew from my Mother and Grandmother. Those memories are very dear to me. I have no children to pass on my knowledge of sewing to but I have many sewing sisters that we all share our techniques and knowledge. It is wonderful. I was taught to sew by a home economics teacher when I was in eighth grade. I have not taught anyone how to sew but I have taught a few people how to quilt. I was taught in home economics in 9th grade. My mother and grandmother sewed and would help me out when I had questions. I taught both my daughters to sew when they were younger. At this point in their life they really aren’t interested in sewing and bring the projects and repairs to mom. While my mother did sew, she did not teach me how to sew. I always loved the few dresses she made for me as a young girl. I learned to sew in Home Economics and loved it ever since. I would sew everything I could. This included my homecoming dresses, swim suits, wedding gown, maternity clothes, curtains and my kids & grand kids clothes. I am teaching one of my daughter-in-laws to sew and I’m also teaching my 7 yr old granddaughter. The granddaughter is very enthusiastic! I love that time with her as we share something very special! My Girl Scout leader taught me and then I took Home Ec in school. We just retired and moved back home to be close to family and I’ve had 3 requests from family members to teach them. My mom taught me to sew simple items in grade school and I learned more in 7th grade Home Economics. In fact, the first day in Home Ec., I was placed at a brand new machine with lots of bells and whistles of the day – 1966! I asked to be switched to an older machine that was like mom’s. Days later my mom came home with the same, brand new machine I was originally seated at!. The teacher graciously let me switch back! I started teaching my daughter to sew just before she got married and moved away. I gave her my older Bernina (after I bought my 580!) and now, when I visit, we try to have some kind of sewing lesson. My mother, grandmother and aunt first taught me to sew. I later took Home Ec classes in high school. I taught my sister-in-law how to sew and now my daughter is asking the learn! My mom taught me how to sew and my home ec teacher taught me how to do it right. I taught my daughters how to sew, and a neighbor’s child. My Grandma helped me to sew my first dress! Fascinated by Grandma’s treadle machine and loving the feed-sack skirts she made for me, I couldn’t wait to take Sewing in Home Economics — seemed like forever until I was old enough. That led to many home-sewn dresses. With two young granddaughters in mind, I bought a couple of second-hand sewing machines; enrolled them in Mini Pins classes at Beth’s Creative Stitchery (Columbus, Ohio) and oohed and ahhed over their first proect: patchwork pillow cases. At every opportunity, I share sewing tips and techniques with them. Sewing creates generational bonds that last. I actually taught myself to sew by following the instructions in clothes patterns. My mom sewed our clothes when we were kids, but I wasn’t interested in learning to sew then. The bug didn’t hit me until I was in college. I haven’t really taught anyone else to sew, but I have brought a couple of friends into the quilting fold. My sister Aleida introduced me to sewing , she made her prom dress and I would watch her as she would cut out pattern pieces on her bedroom floor. It wasn’t until my first year in high school though that I had my first sewing class. My grandmother and my mother were my sewing teachers. I also had a home ec class in junior high. pincushions and I still have some that she made. It was required to take sewing (home ec) when I was in high school. Made a dress. Did not sew again until I was married with 2 little girls. Bought an Elna, year was 1973, and took sewing classes. Stopped sewing around 1980 and never sewed again until Sept. 2013 when I bought a Bernina 750QE with embroidery. In this past year I have become an “obsessed old retired lady” ðŸ‘. In one year have purchased that machine, a serger, another Bernina –upgraded 200, the software 7 Editor Plus and most recently a sit down quilter.. Is this absurd–I think not. I take endless classes and love—really love my Bernina dealer’s shop–Atlanta Sewing Co. The employee base is FANTASTIC!! I worked 37 years for one company, retired in 2002, learned to knit and in 2013 rekindled a passion I intend to do until I see the Good Lord… Thanks for asking!!! My mom taught me to sew. My aunt taught me to quilt. I am teaching my niece to quilt. She has almost finished her first quilt top. Like many of us, I learned to sew from my mom. Later, I was required to take Home Economics in school, but really it was my mom. I have taught a bunch of kids to sew. I am a teacher and community service is an important component of our school. Twice a year I have a group of 5 or 6 students, and we make small flannel quilts and then donate them to Childrens Hospital – by kids for kids. My mother taught me to sew and I taught my two daughters to sew also. Now I am having fun teaching my 4 grandchildren to sew. My grandmother taught me hand sewing and my mother taught me machine sewing and how to use a pattern. I passed on my knowledge to my two daughters and my grandson! I still love making clothes and often enter competitions in my home town. I’ve sewn everything from tents to tutus and also love to do charity projects. Sewing keeps the love flowing!! I learned how to use a sewing machine in 7th grade from a teacher, whose name will always live on, by the name of Miss Asselstine. My cat refuses to learn. Home Ec teacher got me started and self taught from there – love working with fabric – will teach my daughter as much as she would like. My name is Polly = my grandmother taught me to sew first doll/Barbie clothes by hand around 4 and soon after that had me at the sewing machine. I have taught my 2 sons and 1 daughter, also working at Hancock’s and Joanne’s I have helped many customers with their projects and shared the things I have learned over the years. that was the best part of working at fabric stores. Now I am teaching one of my grandsons and starting with one of my granddaughters I have 10 total so this will be fun to watch them and see if any have my passion for the craft. My Aunt Pat taught me to sew my first 4-H project which won a blue ribbon! Later I took years of home ec in high school where there were Bernina machines. I waited another 35 years before I had one of my own! I learned how to sew from my mother, beginning when I was 7. My Grandmother also taught me and we enjoyed our sewing time together. Today, I am now a professional pattern engineer and I teach clothing construction & fashion design classes to homeschool students via an online Christian homeschool academy. My classes are live weekly and I’m so blessed to pass on this knowledge & love for sewing to future generations! I first learned in Home Ec in middle school. I reintroduced myself to sewing when I was thirty by sewing most of my work wardrobe (almost all were *easy* patterns), but then stopped sewing again until a few years ago when my husband surprised me with a new Bernina. Since then, I’ve been taking classes, both through my Bernina dealer, as well as through the local community college “Lifetime Learning” classes. I learned a lot in all my classes, but there is nothing like good, old fashioned, practical experience. I primarily learned to sew from my middle school and high school home economics teachers. During my high school years, Mrs. Lipman, was my teacher and mentor. She instilled in me the love of sewing, which I have carried throughout my life. I have tried to share my passion with my two daughters. We have worked on a couple simple projects; sadly, they really have no interest in learning. I suppose we each find what speaks to us. My mother taught me how to sew on our 1930’s singer sewing machine when I was very young (9 or so). Since then I have taught several friends how to use a sewing machine and assured them it isn’t as complicated as their fears made them believe it was. I learned how to sew from my mom and from home ec classes in Jr. High and High School. I have since taught my daughter how to sew and will be beginning a class to teach how to sew to local homeschoolers. Learned hand quilting from my mother-in-law and really enjoy it. I taught myself to sew one weekend when I was ready to move beyond cross stitching. One Friday evening after work and after fondling fabric for a while at my (now defunct) Hancocks Fabric store), I bought Eleanor Burn’s Quilt in a Day Log Cabin book, the recommended fabric and headed home expecting to have a completed quilt by Saturday evening. Well, it did take longer than a day. After two long days of cutting and sewing, by Sunday night I had a finished quilt. It’s so wonky, but my daughter has loved it to death, the remnants now stored in my closet. I became an avid quilter that weekend, a weekend I will never forget. My Mother taught me how to sew. She learned right along with me. I’ll never forget the corduroy skit we made and we didn’t know about nap. I am teaching my three granddaughters how to sew. We like to do small projects. Just got done with a small fabric basket. My mom taught me and then I took home Ec in school. After I was married I just taught my self more than I learned in school, I love to sew! I’ve taught both daughters and I’ve got three granddaughters I hope to teach. My mother taught me to sew as well as learning in Home Ec classes in school. I’ve taught a few people to sew and quilt. Love teaching and exciting others about sewing. My Bernina makes my passion so enjoyable and was the best purchase I have made. My Mom remarried when I was 8 and my awesome new grandmother taught me to knit and crochet right away and started me sewing. At 11 my parents bought me an old treadle…I made my mother square dancing dresses on that thing. There’s never been a period in my life when I didn’t sew. Love my BERNINAS. I made an apron and a duffel bag in middle school home economics. My teacher was amazing. I sewed off and on through high school and got back into it seriously about 6 years ago. I decided to upgrade from my hand me down Kenmore a few tears ago and thats when my lo e affair with Bernina began :). I learned to sew about age 12 when my mother got a new singer and I took lessons that came with the new machine. Am 76 and still sewing although I have moved from making clothes for my kids to quilts for grandchildren and now enjoying some art quilting with dyes and painting. I learned to sew in 4-H, with a 7th grade home economics class, and with my Mom’s encouragement and help. When he felt I passed beyond her kill set she refused to do any sewing for me, and I was on my own from that point at about the age of 13. I also began sewing for others not long after that. Through the years I have made men’s suits, bridal and bridesmaid gowns, and for many years all of my children’s clothing, nearly all of my fabric related home furnishings including draperies. I taught both my daughters to sew, one of whom does magnificently now in her 30’s, and have alsol assisted in teaching my 10 year old granddaughter, who finished her first small quilt in 2013. My aunt and mother taught me how to sew and I was using the sewing machine when I was in the first grade. My aunt was a professional and sewed and did alterations for upscale clients in the Dallas/Ft Worth area of Texas. She even worked for many of the stars on the series Dallas. She taught my mother and I many tricks of the trade. I just wish I was half as good as she was! I in turn taught both my children to sew when they were in early elementary grades (a boy and a girl). While they don’t sew a lot, they are both able to create any projects they desire with a sewing machine. I took a class to learn my machine but my mom had taught me pretty much every thing else. Yes. I’m teaching a beginner class now! My mom taught me how to sew and I have taught all 6 of my daughters. All of my daughters love sewing still. I’ve also taught many other girls to sew through 4-H clubs I was the leader in. I learned basic sewing skills from my mom for my Girl Scout sewing badge. Years later learned counted thread work and did mostly that for about 10 years. Just recently jumped in with both feet and bought my Bernina and I am lucky enough to have three different shops close by that offer quilting and sewing classes! My mother made all of my clothes until my first purchased garment as a junior in high school. I then majored in home economics education and taught among other things, sewing in junior/high school for 13 years. I have done some sewing with my grandchildren. I have done some embroidery sewing with a niece. Also have quilted with nieces. Now my love in sewing is quilting. I now have 2 Bernina machines. My nieces and nephew all have quilts that I have made. My mother taught me to sew when I was about 10 and started 4H. I have taught sewing to many 4th grade girls in the last 10 years as part of a church girls club. Sew much fun! I learned how to sew in Home Ec class during my Jr. High years. My sister-in-law taught me how to quilt. These days my 4 grandchildren (even the boy) want to learn to sew, so I have been teaching them. I took the 2 older girls to a local shop where they each made their own quilt! continued to teach me. My mother was a seamstress also and helped me too. and error. Been sewing over 40 years. My mom taught me to sew. I started with Barbie clothes. Over the summer I taught my friends grandson to sew. We made some very cute pillow cases. My mother taught me to sew, my Grandmother gave me the love of quilting, and my Aunt keeps me going. I’ve tried to teach my daughters to sew, they aren’t interested right now, but they have the basics down. I have taught a girl scout group how to make pillow cases and a small quilted hot pad. My mom first showed me how to hand sew when I was quite young – 5 years old. But it was my neighbor who started giving me lessons on the machine when I was 7. I took home economics and sewing in middle & high school, costume design & pattern making in college, with lab hours working in the costume shop. That’s where I was introduced to industrial machines and learned how to thread a serger. It also is when I started sewing for professional theater companies during my summer breaks, and where I really refined my sewing skills. Over the years I’ve taught my brother how to sew, as well as helped out friends and family with their sewing questions, ranging from hand sewing to fabric selection to machine tricks and making patterns. I have mostly taught myself. I have a lot more to learn and want to better. I have a friend who is an excellent seamstress and she is always giving me tips and how to’s! My mom taught me to sew. She started when I was 8 and continued through out my childhood and still helps me some now. I love to sew and I am so glad that she took the time to teach me. My mother taught me to sew in the 5th grade and then in the summer, the extension service had sewing classes taught by the home economics teacher. I began designing for Barbie at about age 7. When I was 11, Mom handed me a pattern, zipper, yellow seersucker and said, “I’ll be in the living room if you need me.” So proud I was of that dress! I run “Hope for God’s Children Dorcas Clothing Ministry” which provides clothing for children in Uganda. It’s a privilege to teach others a talent to serve! My friend Becky taught me to sew. I’ve helped some other friends with projects. my wonderful mother taught me to sew… she has and still is a wonderful resource at the age of 88…I helped my grand-daughter get started with sewing when she was 10 and a friend’s daughter came to me for a couple of lessons in simple sewing techniques.. always willing to help others get started in this wonderful hobby. I learned how to sew in Home Ec. in high school & I also had a neighbor & my Dad teach me some sewing as well. My mother taught me how to sew more than 60 years ago…it was “self-defense” on her part because I would not leave her Singer sewing machine alone. Today, I sew on a Bernina Activa 135 S, and LOVE it! I still have my mother’s Singer, but it is currently in “mothballs”. I have taught my adult daughter to sew, and now I am encouraging my daughter-in-law, and grand daughters efforts at sewing. My mom taught me first at about 6 or 7 Then I learned more techniques in Home Ec. I am still learning from many of the professionals, semi professionals and friends. I hope I never stop learning. New things keep it very interesting!! I taught my sons what they were willing to learn then my granddaughter. My Mom taught me to sew, I think I was 8 or 9. I have tried to teach my nieces to sew too! My grandmother taught me to sew Barbie doll clothes on her treadle machine when I was 12 and I’ve been sewing ever since. I’ve taught many to sew, the last being my adult daughter this past summer. She had no desire to sew growing up but now wants to learn! I taught myself basics using books and more recently, youtube videos, but I’ve also had some great instructors at my local sewing center. I haven’t had a chance to teach anyone else yet – still too new! My mom taught me how to sew. The first person I taught to sew was a friend that I met through my husband’s military unit. She wanted to make her hubby a quilt for his return from deployment. We did a lot of sewing, but also chatted a bunch and complained about/encouraged each other through the deployment. I’ve taught myself to sew. I love the Bernina Just SEW It webinars I learn so much. Just now teaching my daughter to sew. Began learning in home ec at school, but my aunt who was also my godmother really taught me to sew. She used to make Halloween costumes with her home made patterns! I’m now trying to pass my love of sewing on to me nieces. Just wished they lived in the same state! My mom taught me to sew as a young girl. She was always making clothes for me because it was so hard to find clothes to fit me in the stores since I was so tall and skinny. My son is now expressing an interest in sewing, so my mom and I are teaching him little things whenever the urge hits him. A lady with a beautiful mind taught me how to sew. Actually she was my former tailor and she had sew lots of dresses and suits before. I asked her to teach me and she accepted. She is now one of my best friend I have ever had! I started sewing when I was 7 with a green manual toy sewing machine. I made a very primitive red dress for my doll. My Mom taught me to sew and by the time I was 13 I was making some of my clothes. I never took Home Ec since I knew how to sew. In my early 20’s I took lessons in the Bishop Method and learned about fabric and fit. I learned how to sew on knits and even lingerie. sadly I have not consistently sewn over the years. Since I am now retired I have been taking some classes for craft sewing at our Recreation Dept with my daughter and granddaughter. I am rediscovering the fun I used to have sewing, and I look forward to helping my granddaughter learn to sew. My Home Economics teacher started me sewing and I made my first apron now, I make a lot of quilts and quilt for others, love to sew. I have taught my grandson to sew and we are taking a class together October 20, 2014 to make are very first Tuffet, it’s the cutest foot stool I have ever seen, I think we will have a lot of fun and I love spending quality time with him my grandson. One of my mom’s sisters taught me how to see by hand. A neighbor taught menhowbtobuse a machine. My grandma and my great grandma were booth crafty and taught me to sew (and knit)… Love them for so many reasons, including their love of crafts. I have tried to pass it on to my daughter and my niece. My mother taught me to sew. Now I have a 5 year old daughter. Just purchased her first little sewing machine. Now its my turn to pass on this great craft. Self taught from the seventies. I’ve sewed off and on through the last 40 years; a good chunk of those years with my hardworking bernina 930. I was first taught to sew by my mother and grandmother – starting with simple hand sewing and cross-stitch embroidery. Then when I was about 7 or 8, they helped me make my first pair of pants in my grandmother’s sewing room. I haven’t taught anyone else yet, but I am hoping to teach my younger brother to sew. My mother and grandmother were my inspirations as young girl. My home economics teachers taught me the basics of sewing. Now I sew for my grandchildren and others! Sewing is therapy for me! My mother taught me, probably. Then I took a 4-week class at the Singer Sewing Machine store in downtown Baltimore. I made a classic 60s shift. Haven’t yet taught anyone else to sew. I leaned to sew on a Singer Featherweight and now have a Bernina 153 and 730. Nothing sews like any of the three. My grandmother taught me how to sew. Now I am teaching my youngest daughter how to sew. She wants her own machine for Christmas this year. I am so happy that she has shown interest sewing. My mom and grandmother taught me how to sew. I recently started teaching one of my friends how to quilt. We are making quilts together, and it is so fun to see someone else learning to enjoy something that I like so much! i am self taught, though i did get some pointers along the way from my MIL. i have taught my oldest daughter, my niece and recently started working with my grand daughter. When I was 12 my mother, a home economics teacher, gave me a sewing machine. Her reasoning was that I’d never be able to afford the clothes I liked. She was right. She taught me to sew and still critiques my sewing projects. Her mother was admitted to the Fashion Institute, but her very Scottish father informed her that girls didn’t go to college. She sewed her entire life. I’m teaching my daughter to sew and really enjoy couture projects. My home economics teacher taught me to sew, and I’m teaching my granddaughter to sew now. Thanks for the chance to win! I had a home ec class in high school. I am recently a grandmother and look forward to sharing this craft with my grandchildren. My mom taught me to sew on her mom’s sewing machine. She also taught me to knit and crochet. I had hoped to someday teach a daughter the same things, but alas, no daughter. However in the last 2 years my HUSBAND has wanted to learn to quilt so I’ve been helping him learn. My mother, Lanell Neumann, taught me to sew when I was 8. She was a great and very patient teacher. I went on to sew for 4-H. Then took homemaking in high school . Again enjoying it with my teacher Eileen Sinks who inspired me to major in college. . I retired after 28 yrs. now I’ve taught my 6 yr old granddaughter, Naserian Ferguson, to sew. Now she has bought African fabric to design and sew her 4 yr old little sister Selah, a fancy dress. That project will be done together at Christmas. I hope thus tradition continues.! I first learned garment sewing in home economics but my mom taught me quilting. We are still quilting together and now I am teaching her machine embroidery. My beloved Great Aunt, more like a 2nd mom to me, taught me to embroider and sew in a treadle sewing machine, that now she’s given me. Now I’m teaching my 9yo daughter to sew. For now we’re working on hand sewing and getting ready to get her started with the sewing machine. Thanks for the give away! My mom first taught me to sew by giving me a piece of patterned fabric like a flower or something and telling me to hand sew around the pattern with small stitches. When I made the stitches small enough she would let me use the sewing machine. I was 5 yrs old. I have taught several young girls to sew with my 4H group that I lead. Now I have a few young women who want me to teach them to sew. My Mom taught me how to sew – first doing cross stitch on towels and pillowcases. Then she taught me using the sewing machine to do simple projects and of course I learned in Home Ec classes in school. Now I am teaching my seven year granddaughter – she made her first pillow case and now wants to make a table runner for her Mom for Christmas. I love being able to share my love for sewing and watching her get excited with a finished project. Next I will teach my three year old granddaughter to sew as well. I taught myself to sew as a young adult teacher more than 40 years ago. I learned to make my own clothes for work. I am continuing to teach my daughter to sew.